Contemporary Aboriginal Art has his origins in the 40.000-year-old history and culture of the Aborigine people of Australia. Most of the paintings reflect on a Dreamtime story. Dreamtime refers to the creation period when ancestral beings, cold Tingari or Tjukaritja, emerged from the earth and conducted activities that led to the formation of the landscape and its inhabitants. In these stories lie the basis for the religion, law and moral systems of life of the Aboriginals, which is strongly connected to the land that they live in. The content of these ancient stories remains the exclusive knowledge of the initiated men. 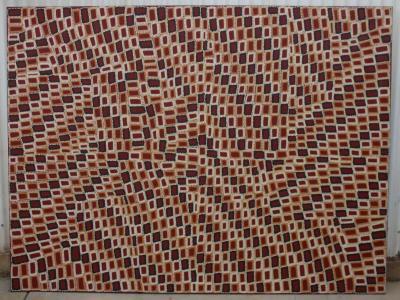 This painting depicts “tali tjuta”: many sandhills of the Marruwa area West of Lake McKay. In a minimal linear style, the artist has depicted a particular site known as Wanapatangu, which is recorded as being northeast of Wilkinkarra (Lake McKay) in Western Australia. This is one of the points where the Tingari ancestors stopped for ceremonial and social activity in their long journey across the desert and now remains as a significant ceremony site for the Pintupi men. 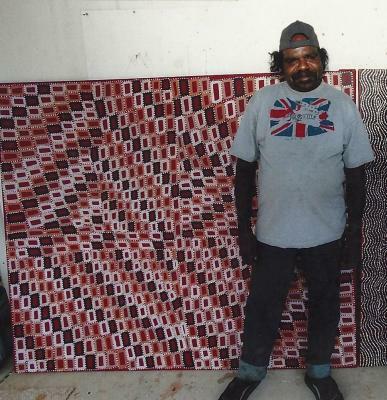 According to the artist, the rectangles mark the watery areas that surround Wanapatangu. In 1984 the international headlines were filled with the ’discovery’ of the last group of nine Australian Aborigines who had managed to retain their traditional lifestyle in complete isolation until the late 20th century. Until they looked for contact in 1984, they had never seen a white man. 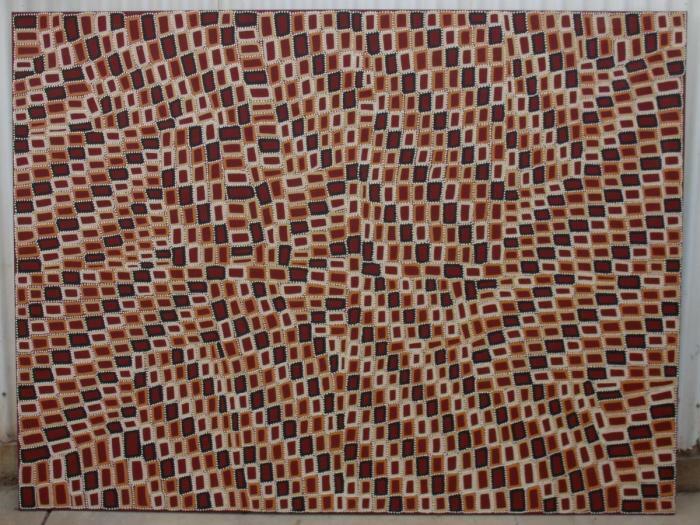 Six of these nine Aboriginals became artists, including Walala Tjapaltjarri. Walala was born ar . . .